These are the Dungeon Set 1 (Tier 0) bracers designed for Warriors. Successfully farmed these in LBRS within 3 runs. I actually got 2 of these in half of a lbrs run. I got these on my third run in LBRS like Sypro. I've been trying to get these things for weeks and I haven't gotten a drop yet. Short of killing everybody in BRS I'd have to say this quest is a complete waste of time and effort. From my experience I doubt they even exist. I was not looking forward to trying to get these to drop. Luckily I found them in the AH for 38g before heading to BRS, it was well worth the cost to get one more quest closer to Loremaster of Kalimdor. I've been looking for those for 2 Weeks now, at the AH, Spaming in trade and going to L/UBRS. I've even gone to other realms to see if there are in the AH there, EVEN Silvermoon which has 60k Auctions and - No. 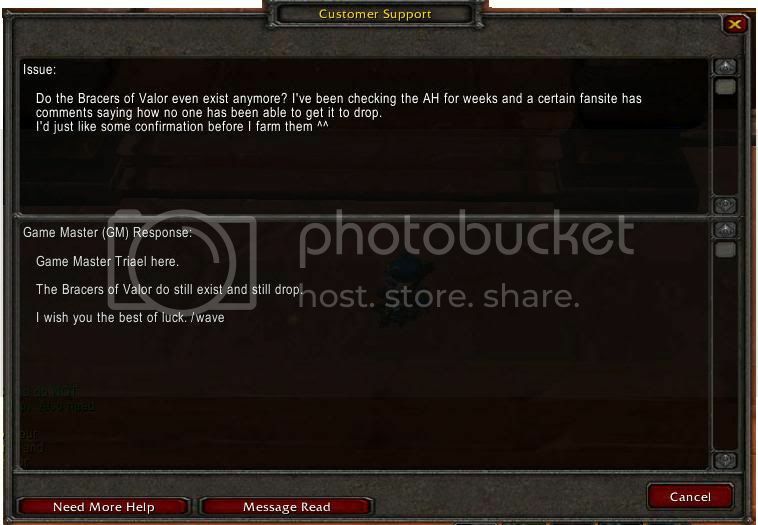 I got a response to the missing Bracers of Valor question. Apparently we aren't farming hard enough. My wife had a quest for these. I decided to run her through to see if we could get them. Fifth group, first run, they dropped from a Scarshield Leggionaire. They are not a myth, they do exist. I'm farming for the whole set to upgrade it. (6) Set : Bei einem Nahkampfangriff besteht eine Chance, dass Ihr um 96 Gesundheit geheilt werdet.